Brian Parks, is a great friend of mine and someone I look up to. He carries himself unlike anyone else and is a man of high character. I was fortunate to spend three great years with him at Wabash where we spent time together both in the classroom and on the football field. I thought I knew him well then but after talking with Brian about his story and how he got to where he is today, I have a newfound level of respect and admiration for him. He has conquered so many challenges and has asked for very little in return. Brian Parks’ life is a collection of trials, tribulations, and lessons learned and it has shaped who he is today. He was born in the heart of Indianapolis to a single mother as the youngest of four children. As I quickly found out in our interview, Brian’s mother, Tonya wouldn’t let him settle for being ordinary. Tonya played an integral role in his character development by exposing Brian to religion, role-models in their community, and instilling the mindset that hard work will take you anywhere. I couldn’t believe this but his hard-working mentality started to click when Brian was just eight years old. He began his first job pumping gas for a dollar at a time. He would often use his earnings to help his mother pay for food. Think about that. One, being eight years old and having a job but also being that young and helping provide for your family. That’s a responsibility and a burden that many people don’t experience until after college. It’s a true testament to Brian’s character and drive. This experience kick-started his development and is a period in his life that I know he is thankful for. While Brian may look back on this time in his life and appreciate the grit he acquired, he explained that this ultimately led to frustration and dysfunction between himself and some members of his family. Amongst the chaos, it became a pivotal time for Brian and his older brother Johnathan to cultivate an inseparable bond. When Brian and I started to dive into their relationship, you could see his eyes light up. You could feel the connection they have and the mutual respect and admiration for one another. While I’d love to write every story Brian shared about their childhood, I think it’s worth understanding that even through times of turmoil and frustration, the emotional stability Johnathan provided Brian helped him appreciate the importance of family. Johnathan was a father-like figure in Brian’s life. He saw the raw potential in Brian and took on far more responsibilities than just that of an older brother. He wanted to be the support Brian didn’t have from his father and he sought to expose Brian to new opportunities like athletics and extracurriculars. Football was something Brian gravitated towards after watching his brother and friends play recreationally and through organized leagues. Brian saw that football is much more than a game, it teaches you about the importance of teamwork, resilience, and pushing oneself. All three of these values represent how Brian lives his life and football proved to be the perfect sport for him. 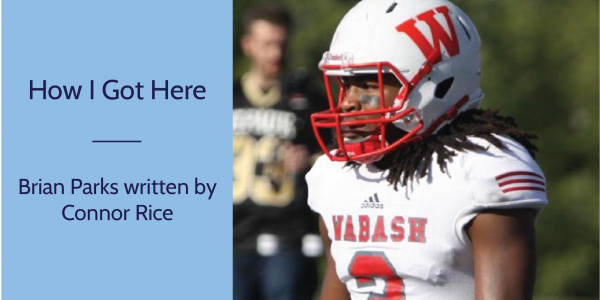 Brian excelled on the gridiron during his high school career, which caught the attention of one of Wabash’s coaches, David Denham. Coach Denham quickly found out about the impact Brian had on his community and his team at Arsenal Tech high school, which led to an incredible relationship between the two of them. During the recruitment process, Coach Denham showcased great respect for Brain and had a large impact on his decision to attend and play football for Wabash. Brian didn’t let the obstacles of his childhood and background define him. His story thus far has taught him that hard work prevails in the end and Wabash proved to be the right place for him to continue learning and growing as an individual. His football and academic career were filled with their fair share of hardships, but through it all, he persevered and accomplished a great deal. Prior to Wabash, Brian forged a friendship with Orr Fellowship alum, Tanner Halbrig. It was during this time that Tanner’s friendship developed into a mentorship for Brian as he ventured to Wabash. Tanner’s guidance led Brian to explore Orr Fellowship as a postgraduate opportunity. Seeing Tanner’s Orr experience and understanding how it benefited his development left a great impression on Brian. He saw Orr Fellowship as a great opportunity for his career path and as a way to get involved in the Indianapolis community, making a positive impact in the city where he grew up. Orr provided Brian the chance to become part of an energetic and passionate group of people after college. It goes without saying that Brian Parks is a remarkable individual. It’s been incredible to see Brian develop and I’m honored to share yet another experience with him as we are in Orr Fellowship together. Brian’s continuous pursuit of excellence has already and will continue to impact the Fellowship. From beginning to work at age eight to pursuing collegiate football to starting his career in Indianapolis at IU Health, Brian continues to put forth great effort to accomplish his goals. As his story goes on, I have no doubt that he will continue to work hard, learn, and grow individually while inspiring those around him.